For a lot of years our bedroom has been forgotten. Yup, it became a dumping ground of non-bedroom things and it was dark. Very dark. Why? A lot of reasons. It became a dumping ground because we only have a two bedroom townhouse and both bedrooms had to be used as bedrooms. At the same time we started a business. So, our bedroom became an office as well. Then that just took over our space. Also years ago Troy had a night job so our bedroom needed blackout curtains so he could sleep through the day. When he no longer worked that job, we still used blackout curtains because it kept the room cooler and the sun really does beat down during the afternoon in our bedroom. So, this became normal. I never really even thought about it. I also avoided our bedroom. I slept there and then didn't go back into the room until it was time to go to bed again. And then for a couple of years our bedroom really reflected where I was mentally. It was a dark cave to crawl into to get away from the world. Not a happy or comfortable room. Just a dark hole. We finally moved the office/business things out of our bedroom. But, there was still a ton of clutter from just dumping other things in there. And it was still dark. A lot of things shifted for us last year. Things started to lighten up mentally and emotionally. I started slowly seeing my home through fresh eyes. And honestly, I didn't like what I saw. It was almost like a veil had been removed from my sight. Now I would love to say that I miraculously jumped right in and went to town reclaiming my home. Isn't that how it is done in the movies? Well, real life is different. It takes time. I'd been in a fog for a long time and coming out of it wasn't going to be a quick fix. I started with just little things here and there. A weird fact was that I felt like I no longer knew what I wanted in my home. My life has gone through major changes. And I felt lost. I wasn't sure of what direction I wanted to go in. I knew I didn't like what I saw everyday in my home but, that doesn't mean I was struck with some great wisdom on how to fix it. And I needed to fix a lot of things that had nothing to do with my home. Once again that sense of being overwhelmed hit me hard. My brain said to jump in to the main floor of our home because that is the common area. That is what people see when they come in. That is logically right? And I tried doing a little bit of this and that. And to be honest, nothing is still the way I want it to be. It's going to take time. Still my bedroom was really bothering me. It made me sad when I went in there. But, it seemed foolish to start with a room that nobody but Troy and I see. Then a couple of weeks again I wasn't feeling good. I decided to go upstairs to our bedroom and lay down for awhile. And that is when it really hit me. I hate this room! This room makes me feel worse every time I walk in it. It should be a room of comfort and relaxing. And I felt neither of those things when I was in it. Decision was made! I am going to work on creating a happy and comforting bedroom space. The rest of the house will just remain clean and slowly change but, our bedroom is my priority now. What a wonderful feeling that gave me! Within a couple of days I went in search of a new bedspread and new curtains. Those were to two first things I felt I needed to change. Our bedroom needed to lighten up! Let me tell you right now (although most of you that have been around a while already know this) I am doing this change-over very thrifty. Troy and I are still making saving money for a house our number 1 priority. So, just a little money will be spent. But, thats okay with me. I am very resourceful when it comes to finding very thrifty alternatives to things. And I love a challenge! I now have a clear mission! I know that there are some amazing decorating blogs out there. And they show all these awesome and stunning makeovers. Thats probably not going to be done here! LOL Just keeping it real. It will be small and simple things. A little at a time. And for no other reason than my own need, I'm going to share my progress here on TTG. Wow! I sure did have a lot to get off my chest about this change in my life didn't I? So, off to create a happier bedroom I went. I knew my biggest expenses were going to be the bedding and curtains. So I gave myself $50.00 to change these things. I knew that wasn't going to be easy because I planned on not going second hand with these two things. Yup, Diann was shopping retail! I headed to a warehouse close out/buy out store. I didn't set any color or design limitations. I just knew that I wanted something new and light and trusted that something would jump out at me. I am happy to say I found what I wanted and am very happy with my choices. And I stayed under budget! Woohoo!! Once I got home, the dark quilt and dark curtains came off and went straight into the washing machine so they would be ready to be donated. Let me tell you, when those dark curtains came off I was so surprised. Suprised by the fact that my walls were a pretty buttery yellow and Holy Cow I needed to dust! I bought this king size quilt set. It came with 2 king pillow shams as well. $19.99. Not too bad. I really like the pattern and the shade of blue. I thought it looks nice with the pale yellow walls. Once I found the bedspread I knew I wanted simple plain white curtains. That would completely lighten the room up. I don't even want a valance. I just want the simple white curtains. It's just a plain white cotton linen curtain. I needed 4 panels. Each panel was $5.99. So, $23.96 for curtains and $19.99 for the quilt set. Grand total of $43. 95. (plus tax). I know in the big picture these two items don't seem like much. But, they made a huge impact for me. I got the room all dusted and started cleaning out things and organizing things and even started changing out old decor for fresh new things. I'm still working on it and will share as I go along. Thank you for visiting and just for being wonderful readers/friends! My sweet friend! What an honest and open post. I know the darkness you have gone through and I'm so happy that you and Troy are coming out the other side of it. 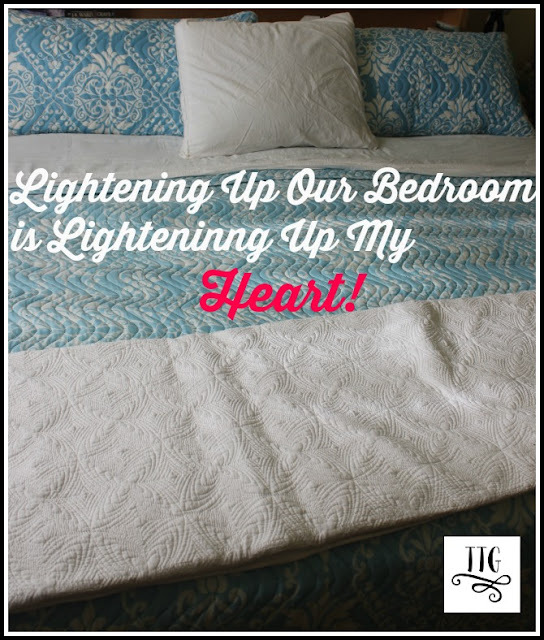 The new linens are so pretty and JUST what you need to lighten up you bedroom. You can do amazing things on your budget and I look forward to you makeover! My heart is happy for you. Thank you Linda. You have been with me through the ups and downs and I love you for your friendship and for sticking with me. Looking really nice. Will be looking forward to seeing more!!! thanks for sharing. Thank you Bonnie. I appreciate you stopping by and for leaving this nice comment. Robyn Thank you! I am glad you stopped by and thank you for letting me know that you like the changes so far. I agree, simple living is becoming my goal! Good for you - and actually they say where you sleep and love one another is the most urgent and most important room in a home..............where you begin your day and where you end it - so you did well changing this first! You have a talent for finding nice things frugally - that's a great value you got there! I know this is a great start for you. What fun to redo your bedroom. I think the bed set looks beautiful. Thank you Pam! Its amazing how just a few small changes can really motivate me! Each time I clear out another space in our bedroom I just feel so much more calm and peaceful. I've been where you were and it is hard to get started again. So you have made the very important first step. Your quilt is very pretty and light and you are using my favorite color combination - blue and white. Thank you for your honest and heartfelt post. Looks beautiful. I'm glad you let the sun shine in. ENJOY the difference.